One night in Seattle was awesome. We felt extremly flattered to have been invited to an event where we rubbed shoulders with some of Who’s Who in Seattle, but this is a running blog not a stroke your ego work blog. Just needed a quick shameless plug. 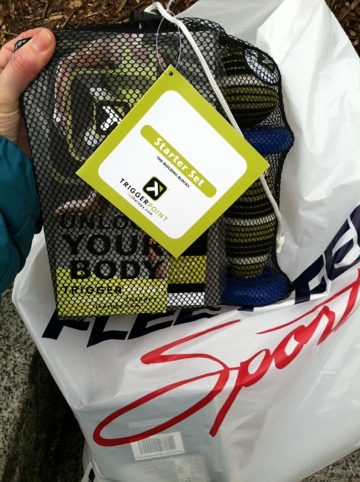 Since we were in Seattle I was able to stop by Fleet Feet It is hard to be in a real city and not go into a running store just to inhale the sent of plastic soles and spandex. This time however I thought maybe I should get these shin compression ice things I saw in Skinny Runner. Well they were 30$ for essentially an ice pack. Um, no thanks, especially no thanks since I’ve been getting the “bla bla money, bla, we can’t spend any, bla, stop, bla, spending, bla, bla, words, words, money, NO, bla money, NO spending, drive thru, money. Lecture. Lecture. Ok I get it. We are broke. Whatever. But there I was…in the hands of an attentive listening, gangly, skinny young man. I don’t know what happend but whoosh I was dropping a Ben Franklin. He sat across from me and had me extend my leg. 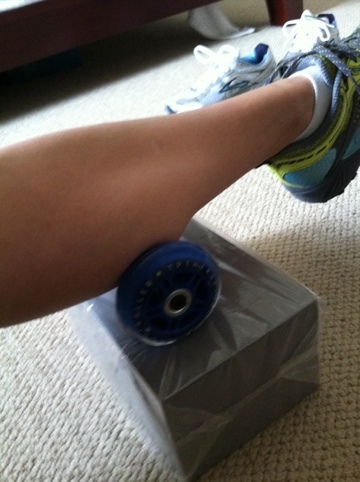 Then he put my calf on this rolling thing and pushed down into the roller and had me do some exercises. Holy Freaking Sh*t it hurt so good. Ouch!! “yep looks like a really tight muscle” all smugly he says. I look at him with love and hope in my eyes. “Um, so how much is that…thing?” me very desperate and winded. “70$” non chalently he replies. I walked out with my fancy bag and immediately called my running partner and had her talk me off the ledge. Clearly I couldn’t talk to my husband about the incident and I needed validation, like ASAP. Here is where the story actually comes together. Um I don’t know what the hell happened but the next day the pain was GONE like 92% GONE. 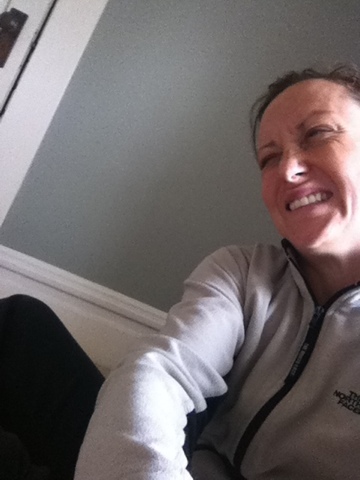 I did the hop test and the run down the driveway test. I could not freaking believe it! 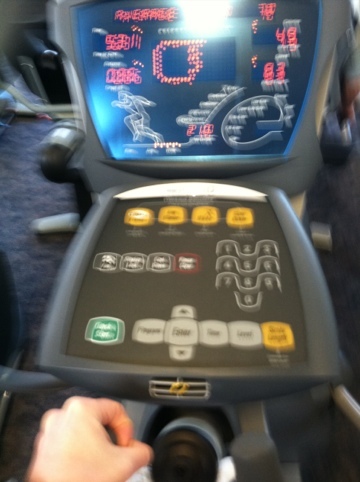 I decided not to mess with it and go on a run like a big dummy so I did the elliptical for 35 min and it felt great. Towards the end I felt a little “something” but no biggie. Rushed home, bowed to the roller therapist and rolled away again. See I even left the plastic covering on the expensive foam block in case I was so lame that I tried to send the stupid kit back. So moral of the story: I think it really did work. Check it out. I was so exited I told all my friends. All 3 of them. I’m extremely skeptical by nature so I wanted other people to try it out and see if they got any results and see if it helped them heal of course. Right now I still believe it is magic. 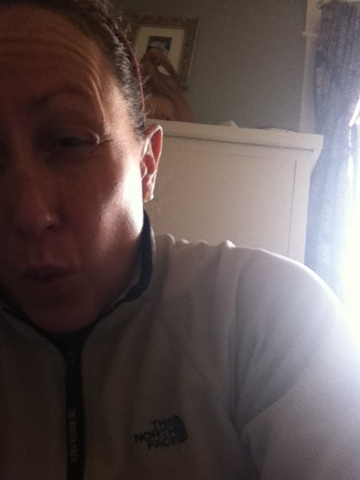 I will be at the half marathon starting line on Sunday! Any one ever try tp therapy products? Did they work for you? Any one have a magical recovery story too? Love to know! Jesus Christ Becca! You make me laugh so hard. I loved the “money, blah, blah, no spending, blah, blah”. I love that I touched your ball. I love that YOU talked me off the ledge. I’m feeling lovey. Dammit…another glass of wine please! You kill me! Best money ever spent, don’t you think? Didn’t your husband agree? Let’s hope the shin continues to feel great!